ElectronicKitSchool. - When do you need power supply special for your electronic devices like smartphones, portable audio player, personal medical product and also white led, now you need power supply with low voltage like 3.3 volt or 5 volt. This voltage also used to supply many microcontroller project and also change the all two-cell and three-cell Alkaline, NiCd or NiMH or single-cell Li battery powered products. To build this power supply you can use high-efficient single inductor buck-boost converter with 1.8-A switches using TPS63000, TPS63001, and TPS63002 that all categorized with TPS6300X. In this time, we will show you two circuits using TPS6300X to built smart power supply with High-Efficient Single Inductor Buck-Boost Converter With 1.8-A Switches for many application electronic devices mentioned. From Figure 1 and Figure 2 above show us that there are 2 kinds circuits that build to make smart power supply with 3.3 volt or 5 volt with input 1.8 volt to 5.5 volt. 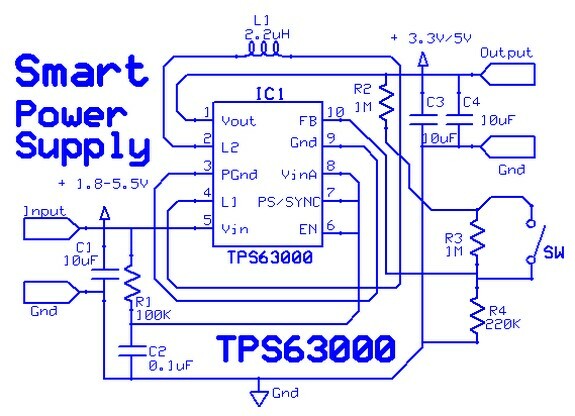 Figure 1. show the circuit smart power supply using TPS63001 IC that only small different with Figure 2. that show us circuit smart power supply using TPS63000. Circuit in Figure 1 above designed only to result 3.3 volt with up to 1.2 A and Figure 2 above designed to get 2 kinds output voltage these are 3.3 volt with open the switch SW or 5 volt with close the switch SW. 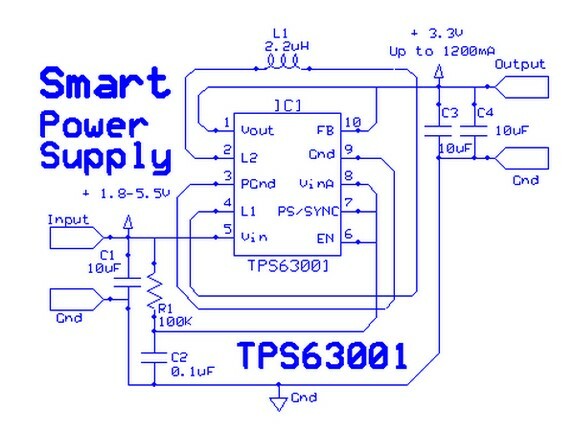 The main component to build smart power supply circuit with high-efficient single inductor buck-boost converter with 1.8-A switches is TPS6300X (TPS63001 or TPS63000). This IC come from Texas Instrument that will give you a power supply solution for products powered by either a two-cell or three-cell alkaline, NiCd or NiMH battery, or a one cell Li-ion or Li-polymer battery. The output currents of this IC can go as high as 1200 mA while using a single-cell Li-ion or Li-polymer battery, and discharge it down to 2.5 V or lower. The buck-boost converter is based on a fixed frequency, pulse width modulation (PWM) controller using synchronous rectification to obtain maximum efficiency.